It’s no secret that a lot of folks have had to tighten their belts in recent years, at least where budgets are concerned. But where money belts tighten, it’s also no secret that belts around our waists are actually getting looser…and in America, at least, much looser. While many have made tough choices to cut back on luxury items, major purchases, and vacations, we still love to eat. Of course, food is a necessity like clothing and shelter, but our passion for food almost seems like the one pleasure we can still indulge without having to sacrifice our life’s savings. From Farmers Markets to the growing, passionate foodie craze, our collective interest in eating is at an all-time high…bucking so many other dwindling trends in the economy. Just how much attention and money is being directed toward this flourishing industry? According to the National Restaurant Association, restaurant-industry growth in employment has outpaced the national economy for 12 consecutive years, with 1.4 million added positions expected in the next decade. On a typical day in 2012, restaurant sales add up to a whopping $1.7 BILLION dollars. Again, that’s in ONE DAY! Yet with some 970,000 establishments all vying for a piece of the pie (pardon the pun), competition is more intense than ever. Two key components to a successful food establishment: turnover and suggestive selling. Getting diners in and out is one thing, but how much they order in a sitting? This is where visual aids help…display holders, table tents, menu sign holders, and restaurant sign holders all contribute to the bottom line. Sure, plate presentation is important, but it all starts with promotional displays and getting the order first. There are numerous acrylic display and easel options being put to use by today’s more successful food and beverage operations. 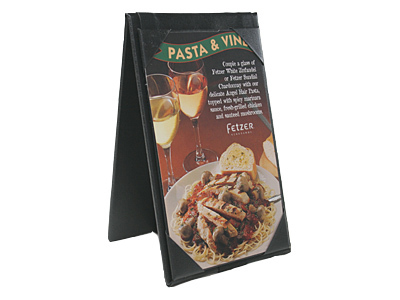 A prime example: Table Tent Sign Holders that accommodate menus and signs for double-sided viewing in some 18 different standard sizes with customization also available. These clear Sign Holders load easily from either side and show your best with mouth-watering appeal! Table Tent Leatherette styles also add a classy look to the table, providing the same double-sided viewing capability in a vinyl material that resembles genuine leather. Both Table Tent styles are sure-fire sales boosters! Looking for larger volume? More eyes make for bigger orders…a big help to your wait staff and more revenue in the register! Restaurant Sign Holders really deliver, especially at larger tables. Why? These four-sided plastic card holders speak for themselves, displaying your hottest specials on four different sides to maximize orders via one crystal clear display. It’s a sign holder that also gets the table talk going among customers…and that doesn’t hurt the bottom line either. Triple-Sided Vertical Sign Holders do the trick, too. 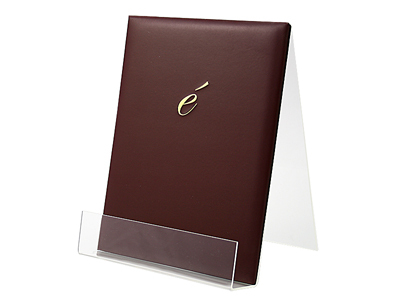 These innovative clear plastic Menu Sign Holders feature interior panels to display the promotional material you want conveyed to customers, with an added outer view that completes a totally professional image from all sides. How about Plastic Sign Holders viewable from EIGHT sides? This vertical top loader always gets noticed and the unique plus-shaped design lets you pick and choose how and what to promote at any given time of day or night. It’s this type of edge that wins at closing time! 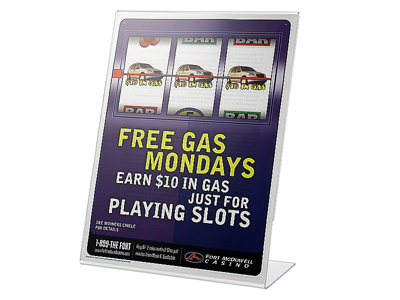 Lucite Sign Holders also impact marketing efforts in a similar way, using a vertical six-sided display. When you consider the options, no doubt your customers will as well. Elegant Acrylic Easels are also popular, giving a slightly different approach to countertop viewing. With focus placed on a frontal view, this eye-catching display stand also gets a lot of looks beyond the food service industry. Retail environments, promotional events, and trade shows frequently use this type of display easel to attract attention…and with excellent results. It’s simple, functional, yet very attractive, whether found in your nicer bars, higher end restaurants, or anyplace with a significant volume of foot traffic. Promotional displays are pivotal, especially in the food and beverage industry. Remember, business is booming for those who play their cards right…just don’t forget that it’s more than the knives you need to keep sharp: it’s the menu holders, too! Sign Display Holders and Glass Green…the Color of Money! Getting products and services to stand out from the competition is an ongoing, ever-evolving challenge. Every day, smart business owners and store managers face questions about price, profit margins, and how to differentiate their offerings in ways that appeal to customers better than the other guy. Sometimes, it all boils down to presentation. So how do customers see what you have to offer beyond the storefront or showroom? Whether operating one place of business or a nationwide chain of outlets, do your customers have the clearest view of what you’re about and all you have to offer? Even the best, top-notch sales staff well-versed in cross promotion and up sells can benefit from visual aids, and one way to really stand out, we’ve discovered, is with the use of Sign Display Holders. After a great deal of brainstorming and experimentation, our research has determined some interesting findings about this striking counter top display. The Glass Green color itself is a strikingly attractive feature that draws the eye. Rounded corners and polished edges also help make these sign holders classy and stylish…a super refined look in 1/8” thick acrylic. 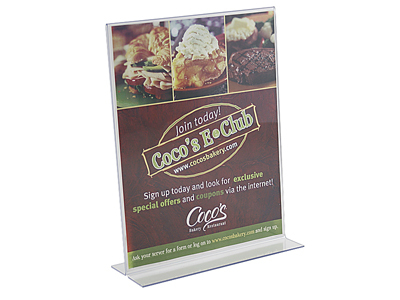 Versatility in the sizes of these sign frames accommodates a pretty wide variety of applications, too – making them ideal for retail use, doctors’ offices, and point-of-sale displays. Fitness centers offering new Pilates instruction? Rental car agencies promoting free upgrades? Here’s a sign holder that gets the message out, loud and clear in refined Glass Green style. No matter what type of professional setting you have for your clientele, every customer wants to be dealt with in a straight up manner. So give them a straight up display and show your best. A Straight-Up Vertical Sign Holder will do the trick, giving your promotional material an added dimension of noticeability. It’s a compelling Sign Display Holder that loads easily from the bottom, shining the spotlight and focus right where you want it…practically acting as a customer service rep all by itself. Sign Display Holders and Glass Green Sign Frames. They may not be for everybody, but then again, it’s a little hard to imagine any place of business that WOULDN’T benefit from their eye-grabbing attraction. Think about it. Going green now has a whole new meaning! No doubt you’ve heard this one before: people eat with their eyes before they take their first bite. Whether you buy the theory or not, it’s hard to argue. When the stomach is growling or you have a hankering for something really delicious in particular, there’s no denying the craving. Of course, this concept’s not lost anywhere in the food industry. Restaurants, grocers, food producers and packagers, distributors, the dramatically increased popularity of TV cooking shows, and the growing reach of “foodie” magazines…all rely heavily on visual presentation as their hook. Food imagery in still photos and TV is now an advertising art form in and of itself. The reason? It all goes back to the eyes. See it, crave it, buy it, eat it. Repeat. It’s a simple formula and in the food world, suggestive selling has a way of producing immediate results and success. But as kitchen competitions get hotter, the right displays can make or break that nightly special. Capturing a strong customer share and profit-building are directly reflected in the ways your presentations are displayed. 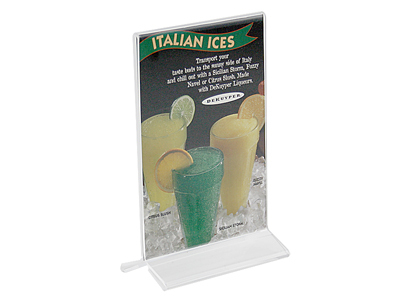 When taking a seat at a food service establishment – even before the wait staff takes your drink order – the first thing customers notice more often are Tabletop / Counter top Sign Holders, preferably acrylic display stands that place an added spotlight on the restaurant’s highlighted offerings. Let the suggestive selling begin. A Straight-Up Vertical Sign Holder display standing on a triangular base showing off steak and lobster on one side and a 2-for-1 Margarita special on the other? Think that visual appeal won’t send an instant message to a hungry and thirsty group just sitting down? Crystal clear acuity with enhanced elegance and class adds to customer curiosity…and adds to their orders, too! The styles and attributes found in a variety of popular displays and menu holders also take on different functions and appearances to best suit the ambience. Vertical menu holders, for example, are geared for use on bars and tabletops…a sloped base allows for custom imprinting, a nice little added touch. The ½” to ¾” space between the uprights provides ideal room for reading material. When the joint is jumpin’ with heavy foot traffic and an occasionally misguided elbow, durability is also a factor in well-constructed sign holders and acrylic sign displays. This just might be the right environment for rough-n-tumble Plexiglass Sign Holders…durable, economical, impact resistant vertical displays that are functional yet elegant. Plexiglass, like the other sign display styles mentioned here, also load quickly and easily from the top. When the need arises to “86” an advertised special, even the busiest staff will be able to quickly replace flier displays with newer, fresher replacement slicks in no time flat. So here we’ve been talking about food and drinks…two sure-fire subjects that appeal to just about any living, breathing person…and how to present hot sellers in the food and beverage business arena. But food service establishments are NOT the only places to benefit from acrylic display stands and sign holders. Some dynamic new designs geared for office and retail countertops have also earned a niche in the display of two-sided brochures and glossies in the spotlight. Swivel base display stands invite curious eyes to the glass green frame, which can be manually rotated for viewing from either side while the satin metal base remains stationary. Swivel stands practically invite human interaction and with this display, printed copy slides in easily from the top or sides. Oval based store displays also lend an element of class, especially on retail countertops. The oval base can be clear or black, presenting options when determining the best look for your campaign. Promoting a sparkling piece of jewelry? The black base could be just the right accent for this store display. Countertops, tabletops, showcases…double-sided acrylic display stands, sign holders, menu holders, oval based and retail displays definitely make a difference. Put them to the test and check the results for yourself. The chances are great that your popularity will rise and so will your profits! When it’s time to put your best face forward, be sure you look your best. Well, maybe not YOUR face, but the face of your business. Nothing showcases a logo, company name, and marketing material better than crystal clear acrylic, particularly Acrylic Sign Holders. They’re wildly popular…easy to load, inexpensive, and they really capture the essence of anything they show. One important factor to remember with all these slanted sign holders is that they’re meant for showing one side…that’s why we say “put your BEST FACE forward.” Let’s use a flyer for a jet ski as an example. An eye-catching front lures a customer already making a purchase at the counter. The back is filled with less eye-appealing specifications and small print. One side sells itself, the other side covers information your sales team can answer after the hook’s been set. With a little help from this relatively inexpensive sign holder, a jet ski may be sold! The point is, when one side is where you really want customers and prospects focused, these displays are extremely cost-effective…especially if they help garner a sale. For any promotional material that only requires one-sided exposure, Acrylic Sign Holders display them at their best with a very minimal investment. 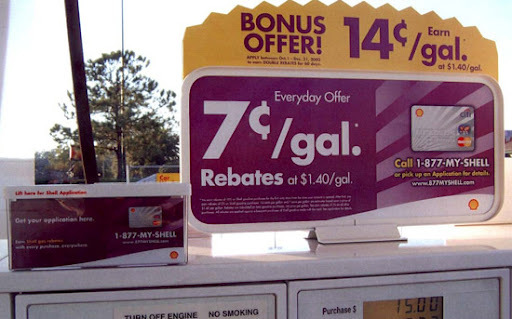 Flyers, signs, and promos captured in black border sign frames do more than highlight in-store bargains, doctor office policies, and lower rental car rates. Though not the most common sight, black border frames do add a stylish element to store and office settings. Clubs, too…very classy! Gaze into the future of Acrylic Sign Holders when you want to put your best material in the spotlight. They’re easy to load and ready for work. A perfect slant awaits, without costing an arm and a leg! No doubt, chrome has been an eye catcher for decades. The shine grabs the human eye like a fish to a hook. When fishing for enhanced revenue, sometimes Chrome Counter Top Wire Brochure Racks are just the ticket. Wire design is practically an art form in itself, which only adds to the draw. One, two, or three tiers in sizes from four inches to eight and a half, the curvature in Wire Displays definitely adds to the aesthetic appeal. That equals real value and shows off magazines and promotional material with a bright, modern look. Plus, Wire Racks can really take a beating. Over the course of time, they stand up to practically anything…like the Energizer Rabbit of non-acrylic brochure displays. Of course, plastic invokes a special passion in our R&D Department, and we’ve developed a handful of plastic displays that are economical and durable at the same time. While they may not have a lot of frills, tiers, and pockets, models the Tri-Flat are still fully functional brochure holders. 4-1/8” wide, a thinner acrylic design gives Tri-Flat displays an “Econo-Boost!” Some models ship flat, and that translates to added savings in the form of lower shipping costs. They assemble easily enough, too. 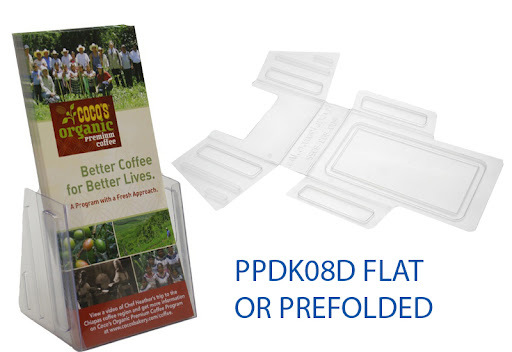 ThinTri-Flat Pre-Folded Brochure Holders don’t ship flat but the thin design weighs less so shipping charges with this particular display are also minimal. 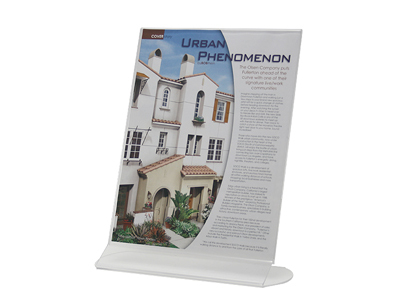 Sleek, affordable Economy Brochure Holders still look and work great on counter tops, and they hold up well over time. For those with tight budgets, Economy Brochure Holders present a range of dynamic new possibilities. Many customers have also asked about Wooden Brochure Holders, and we listened. Soon we’ll unveil an attractive line of quality light oak, dark red mahogany, and medium oak brochure holders…joining form, function, and the rustic attraction of wood to decors where Wire and/or Plastic Displays may just not be quite right. Wood Brochure Displays are also incredibly resilient. Avoid flames and hatchets, and they’ll last a good long time! Like Wire Displays and lower cost Economy Displays, new Wooden Brochure Holders should also benefit the budget-minded. Keep an eye out for the grand unveiling at Plastic Products Mfg. After all, when it comes to displaying your print material, your options are only getting better! Brochure Boxes – Think Inside AND Outside the Box! Sure, thinking outside the box has its benefits. But for many businesses, it’s still just as important to think INSIDE the box as well. No matter what kind of business jargon or visual displays you use, there’s always a place for versatile, protective Brochure Boxes. 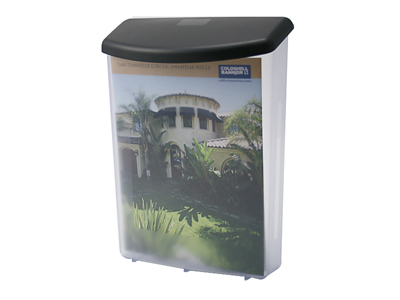 Especially popular with real estate agents, multi-functional flyer boxes are most familiar in outdoor settings. They crop up in more areas than meet the eye, pardon the pun. Hiking trails, biking trails, state parks, national parks, amusement parks, government agencies, and some of our country’s most treasured landmarks all rely on these types of literature holders for their protective features as well as easy access. Because of their sturdy nature, outdoor brochure holders and literature boxes don’t require constant attendance. And they protect fliers, brochures, and other forms of print material from the elements the same way sandwiches are protected in zippered plastic bags…ready for immediate consumption! Available in a multitude of styles, mountable boxes are also popular because they’re easily attached to sign posts, walls, and a variety of other bases and foundations. It’s this user friendly application that gives brochure boxes great INDOOR appeal, too – especially in office buildings, executive centers, and shopping malls, places where foot traffic and general access go beyond store and office hours. Don’t neglect window shoppers! 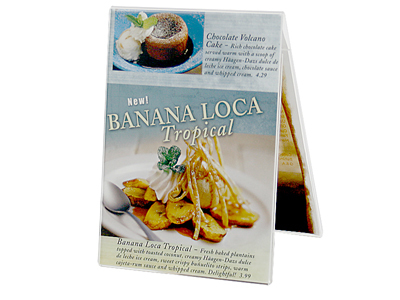 No matter what type of product or service you offer, indoor brochure holders are an inexpensive way to keep the stream of information flowing. They attract the eye and even enhance visibility, something every smart business owner needs. With excellent height, width, and depth attributes, outdoor and indoor brochure boxes provide outstanding value. They’re convenient, sturdy, cost efficient, self-reliant, and capable of holding a LOT of information. Remember, the return on one sale – especially in an area like real estate – will pay for your small investment many times over! Plastic Products Manufacturing (PPM) has announced the release of an innovative new Econo-Boost Trifold display called the Tri Flat Economy Brochure Holder. Lighter and less expensive than previous styles, the Tri Flat captures both the flexibility and toughness of acrylic in one superior display, another in a long line of R&D achievements at PPM. Geared specifically for counter top use, the Tri Flat has been designed to accommodate a variety of materials with dimensions of 4-1/8” Wide x 7-1/2” High x 1-1/2” Deep. With an overall depth of 3-1/2” from Front to Back, the Tri Flat checks in at a sturdy .025” thick. Yet it ships flat, which reduces shipping bulk and consequently, shipping costs. At the user end, the Tri Flat arrives as a singular flat unit that easily folds into an elegant yet economical counter top display – exhibiting the flexible properties of acrylic as well as its durability and cost-effectiveness. For those who would prefer this style ready for use straight out of the box, PPM will also ship the Tri Flat pre-folded with no assembly required. Indeed, this new Tri Flat Economy Brochure Holder appears ready to take the market by storm. The sales staff at PPM is also offering free samples upon request to not only increase product interest, but also to show how quickly and easily it can be put to use. Accommodating brochures and print material up to 4” wide, big results are expected from PPM’s Tri Flat.